Not to be confused with Newton, Georgia. 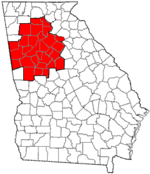 Newton County is a county located in the north central portion of the U.S. state of Georgia. As of the 2010 census, the population was 99,958. The county seat is Covington. Newton County is included in the Atlanta-Sandy Springs-Roswell, GA Metropolitan Statistical Area. Newton county is named after Sgt. John Newton, who served under Gen. Francis Marion, the "Swamp Fox", in the American Revolutionary War. It was created on December 24, 1821. During the American Civil War, the county provided the Lamar Infantry, which was a part of Cobb's Legion. Newton county adjoins Jasper County, Georgia: Georgia is one of many states that have a Newton County and a Jasper County that border each other. In late 1978, the first five episodes of The Dukes of Hazzard were filmed in and around Covington, Georgia. The TV series In The Heat of the Night was filmed in Covington from 1988 to 1995. Also, in Remember the Titans, there were many scenes shot on "The Square" and the final football scene was shot at Homer Sharp Stadium, which is located near downtown Covington. Currently part of the new series The Vampire Diaries is being fiimed on "The Square". Additionally, major films including My Cousin Vinny, Friday the 13th Part VI: Jason Lives and Halloween II, Rob Zombie's sequel to his 2007 film Halloween, were also filmed near and around "The Square" in downtown Covington. Newton county claims to be the birthplace of Georgia 4-H. Actually, the Girls Canning and Boys Corn Clubs in 1904 by G.C. Adams was renamed the 4-H Club in 1906, after the original 4-H Club that opened in Iowa in 1905. According to the U.S. Census Bureau, the county has a total area of 279 square miles (720 km2), of which 272 square miles (700 km2) is land and 7.0 square miles (18 km2) (2.5%) is water. The majority of Newton County is located in the Upper Ocmulgee River sub-basin of the Altamaha River basin. A small eastern portion of the county, from southwest of Social Circle to southwest of Newborn, is located in the Upper Oconee River sub-basin of the same Altamaha River basin. As of the census of 2000, there were 62,001 people, 21,997 households, and 17,113 families residing in the county. The population density was 224 people per square mile (87/km²). There were 23,033 housing units at an average density of 83 per square mile (32/km²). The racial makeup of the county was 55.27% White, 45.21% Black or African American, 0.22% Native American, 0.72% Asian, 0.02% Pacific Islander, 0.58% from other races, and 0.98% from two or more races. 1.87% of the population were Hispanic or Latino of any race. In the county, the population was spread out with 27.70% under the age of 18, 8.90% from 18 to 24, 32.10% from 25 to 44, 21.50% from 45 to 64, and 9.90% who were 65 years of age or older. The median age was 33 years. For every 100 females, there were 94.70 males. For every 100 females age 18 and over, there were 90.20 males. The median income for a household in the county was $44,875, and the median income for a family was $49,748. Males had a median income of $36,742 versus $26,097 for females. The per capita income for the county was $19,317. About 7.20% of families and 10.00% of the population were below the poverty line, including 14.90% of those under age 18 and 8.80% of those age 65 or over. As of the 2010 United States Census, there were 99,958 people, 34,390 households, and 26,165 families residing in the county. The population density was 367.3 inhabitants per square mile (141.8/km2). There were 38,342 housing units at an average density of 140.9 per square mile (54.4/km2). The racial makeup of the county was 53.8% white, 40.9% black or African American, 0.9% Asian, 0.2% American Indian, 2.1% from other races, and 2.1% from two or more races. Those of Hispanic or Latino origin made up 4.6% of the population. In terms of ancestry, 13.4% were American, 9.2% were Irish, 8.0% were English, and 7.5% were German. The median income for a household in the county was $52,361 and the median income for a family was $56,519. Males had a median income of $44,504 versus $33,133 for females. The per capita income for the county was $21,583. About 10.8% of families and 12.7% of the population were below the poverty line, including 16.5% of those under age 18 and 7.3% of those age 65 or over. ^ Krakow, Kenneth K. (1975). Georgia Place-Names: Their History and Origins (PDF). Macon, GA: Winship Press. p. 158. ISBN 0-915430-00-2.